Halloween is quickly approaching, and this is a holiday of thrills, chills, and monsters of all varieties! But why do we have to always celebrate the scary ones? What about the cute and adorable kind? That's what we have here with Gurumin 3D: A Monstrous Adventure, and it's the subject of SuperPhillip Central's next review. Gurumin: A Monstrous Adventure is no stranger to platforms. Originally a PC game in Japan, the game was ported to the PlayStation Portable, which was my first encounter with the game, and later on Steam. 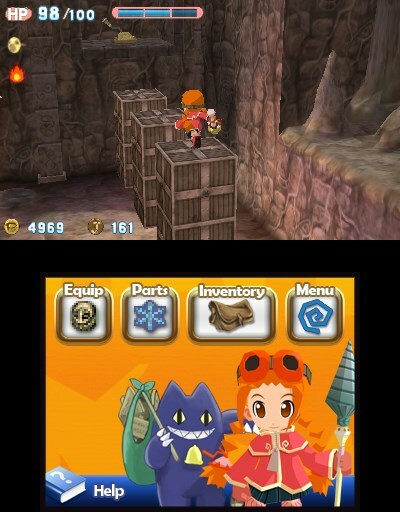 Now, the Nintendo 3DS gets Gurumin with added features, most notably stereoscopic 3D, for an affordable digital-only release. 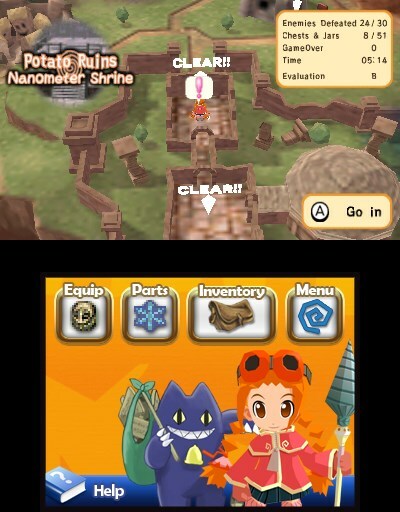 While the Saturday morning cartoon presentation of the game might not be every player's slice of shortcake, what Gurumin 3D: A Monstrous Adventure might be for everyone else is a rewarding game with fun combat, enjoyable exploration, and crafty puzzles to keep them engaged. 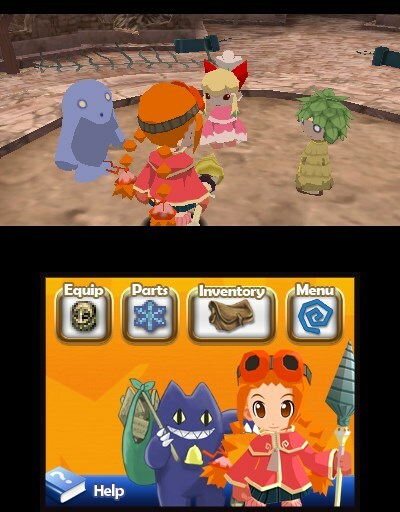 Gurumin follows the story of a young girl named Parin, who moves to a new town to live with her grandfather. He tells Parin that she is the only child in town. That doesn't make for much of a good time, so Parin goes ahead and tries to make one for herself by exploring the town. Upon stumbling on a portal that leads to a village run by monsters, Parin quickly makes new friends of the creature feature variety, although interestingly enough only she can see them when they hang out in town. Nevertheless, the monsters in the creatively titled Monster Village aren't in the best of spirits. A dark mist has surrounded their land and plenty of their priceless possessions have been stolen by a group called the Phantoms. Oh, and some villagers, too, were taken. That's sort of important to mention, right? Taking a modest drill in tow, Parin agrees to return the monsters' possessions to their rightful owners as well as rescue the monster-napped missing villagers, and in the process, gets involved in a plot to save the land from some nefarious foes. Meander around and mingle with the monsters of Monster Village! Gurumin's story is told through some pretty cheesy cutscenes, but their Saturday morning cartoon quality is all part of the game's myriad charm. This is a game for all ages, and Gurumin doesn't try to hide that fact through some complex plot. However, by the ending of the game, which takes about 10 hours (give or take an hour or two) to reach, you'll have to have a heart of stone to not have any warm feelings. Gurumin is labeled as an action-RPG, though that is not telling the entire story here. Really, Gurumin features plenty of platforming, though nothing as intricate as Mario obviously, in addition to its relatively basic combat. Parin can use a variety of tasks, from things as simple as swipe of her drill to charge attacks to pierce through enemy armor, as well as learn numerous special attacks, performed by inputting simple Circle Pad and button commands. The latter is terrific for delivering big-time damage to more health-endowed enemies. With that enemy's armor, Parin will need to charge up her drill to pry it off. Parin enters areas through an interactive world map that adds areas as possessions are returned to the faithful residents of Monster Village, using their happiness from getting their items back to put some holes in the dark mist permeating in the surrounding areas. Areas generally have one of a variety of themes; ruins, caverns, forests, mountains, and more. These, which what can be essentially be called "levels" run anywhere between 10-20 minutes, depending on how much you explore them. Early levels are pretty basic in their design. There are few hazards to worry about and easy enemies to vanquish. As you progress through the game, the complexity of the levels, their enemy types, the hazards to concern yourself with, and the difficulty of puzzles increases. Some puzzles are as elementary as lighting all torches in an area or pushing a box onto a button to hold it down, while others involve a little more thinking. Later levels will stop you from even getting past their entrance through cryptic skull signposts that demand you solve their riddles. In the beginning, puzzles are as simple as "flip this switch, open that door." As Parin progresses, things get a little trickier! Outside of unfriendly monsters to battle, another enemy in Gurumin at times is the unwieldy camera. You have direct control over it by using the shoulder buttons (or with the New Nintendo 3DS, the control nub) to spin the camera around to point it in your desired direction, but there is no ability to tilt it upwards or downwards. This makes seeing areas above and below a problem. Another issue is seen in small rooms where the camera can get blocked by walls. Never did these camera gripes cost me much more than some lost health, but they're notable nonetheless, especially when trying to battle bosses as well as the camera at times. Additionally, there are several occasions where Parin will look like she should be able to grab onto a ledge (which is indeed possible in this game to do), but she'll astonishingly and frustratingly fail to do so. This is more of an issue than the camera, as it led to some unwanted aggravation in later levels. The levels themselves are considered cleared when Parin reaches the goal, collecting one of the monsters' pilfered possessions. One can master these levels through destroying all of the jars, defeating all enemies, and opening all treasure chests. This is a pretty difficult task without the Cat Ears headgear for Parin, as otherwise you don't have a clear tally of how many jars and chests are left in a room or area. You're on your own to hope you've defeated every enemy in a level, unfortunately, which can be a drag when you painstakingly destroy every jar and open every chest only to be greeted with the ending level notification that you only defeated 32 out of 33 enemies instead of all of them, for example. This leads to a lot of replays of levels that seems a bit unfair and unnecessary. Mastering levels rewards Parin with gold medals that can be traded to her grandfather for rare costume pieces and headgear. Curses! I thought I defeated all the monsters in this level, but I was wrong! 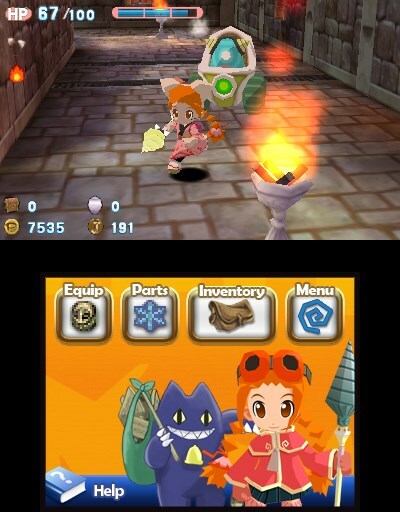 Headgear is essential in Gurumin, and there are many types to be found, purchased, and collected. Some, like the Goggles, prevent damage when in water, while others like the aforementioned Cat Ears displays how many jars and chests are remaining in a given level's room. These headgear can be leveled up by a seller in town who uses junk dropped by enemies to improve the benefits of Parin's various headgear. Parin can switch through headgear at any time through the pause menu, as well as use the same menu to switch drill elements (ice, fire, or electric) and chow down on life-restoring baked goods like cookies, chocolate bars, and slices of shortcake. 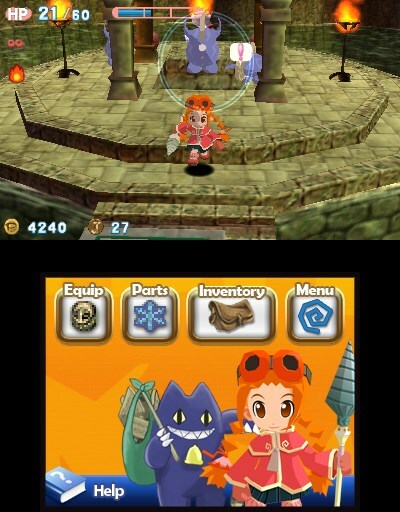 Gurumin on the Nintendo 3DS shares many similarities graphically with the PSP version. It's not much improved in this regard. The only major improvement is the ability to play the game in 3D, though the effect isn't necessary or too impressive compared to other implementations in other games. The sound is a mix of the previously mentioned (endearingly) cheesy dialogue and some catchy tunes to explore the levels. Though an issue with the music stuttering during loading times and transitions is unfortunately present. Some uninvited guests have arrived to ruin Parin's peaceful trip through these ruins. Gurumin 3D; A Monstrous Adventure is not without problems (mostly pertaining to the camera and the requirement for mastering levels), but overall, the game is an enjoyable mix of light platforming, simple combat, fun puzzle-solving, engrossing exploration, and charming storytelling. The additional difficulties, new costumes that you can acquire through multiple play-throughs, and mastering of levels ensures that there will be a lot of bang for your buck if you decide to invest in this affordable adventure. And you should because it's ultimately a monstrous good time. Review copy provided by Mastiff.